It's no secret that we as a family are pretty Disney obsessed! We're currently on countdown for our third visit to Disneyland Paris in the space of a year, and I'm planning on booking our first visit to Walt Disney World very soon - we just cannot get enough Disney in our lives. I've always been a huge Disney fan ever since I first saw Bambi when I was around 3 years old, and so I've always been really keen to pass my love for all things Disney onto my own children - luckily for me it's worked and all 3 of the boys are big fans with all of them liking different elements of the Disney magic - Noah is a huge fan of Moana and the Disney Princesses (Ariel and Elsa in particular!) whereas Sailor seems to really love anything that features animals (He loves watching the songs from Lion King at the moment!) - but Tyne is all about Cars! 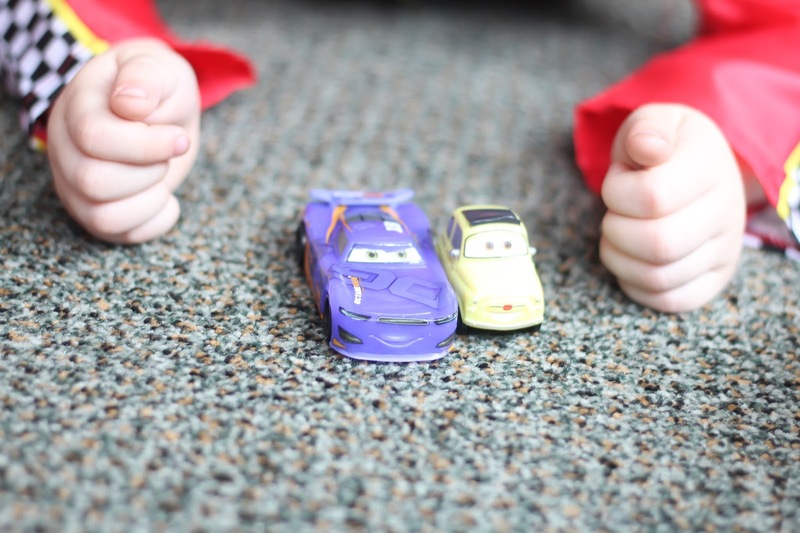 He absolutely loves Lightning McQueen and his buddies, and has been so excited about the release of the new Cars 3 movie - so imagine their delight when the lovely folks at Disney sent the boys a huge box of Disney Cars goodies a couple of weeks ago to celebrate the release of the movie. The boys were all absolutely thrilled - if you caught my Instagram stories showing them unbox everything then you'll know how loud the excited squeals were! 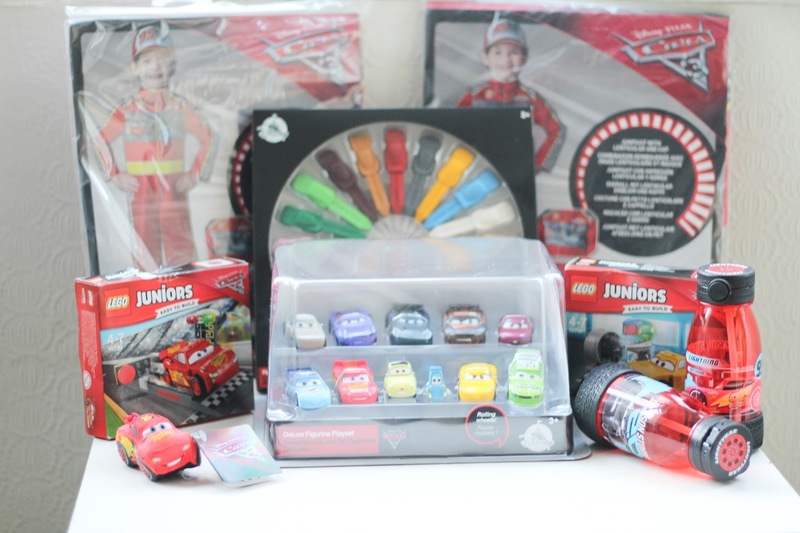 They were sent some very cute plush Backpack Buddies (RRP £5.99) which Noah has taken a real shine to, as well as some very handy drinks bottles (RRP £6.99) , some really cool Cars Crayons (RRP £9.99) which they've really been enjoying and a fantastic Lego Juniors set each (RRP £7.99) which they absolutely loved. 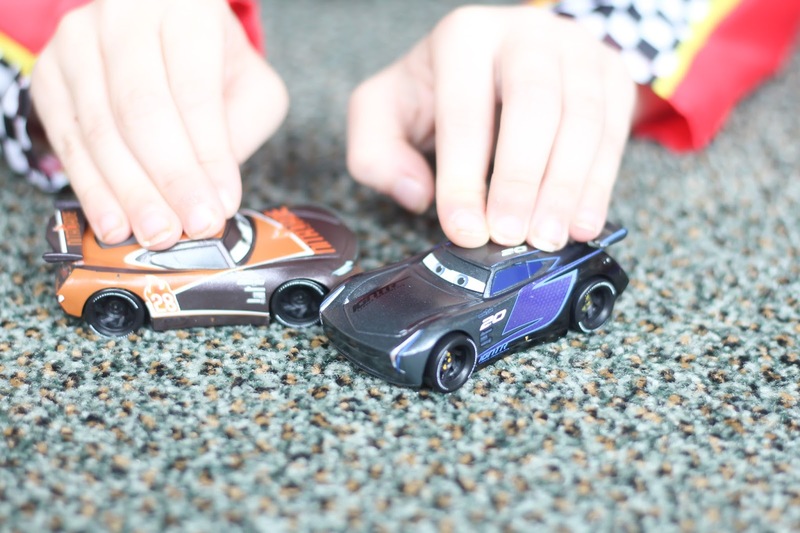 But their favourite items were the Deluxe Figurine Playset (RRP £22.99) which featured 11 of the Cars from the movie - they have real rolling wheels and honestly the boys have played for hours with them! 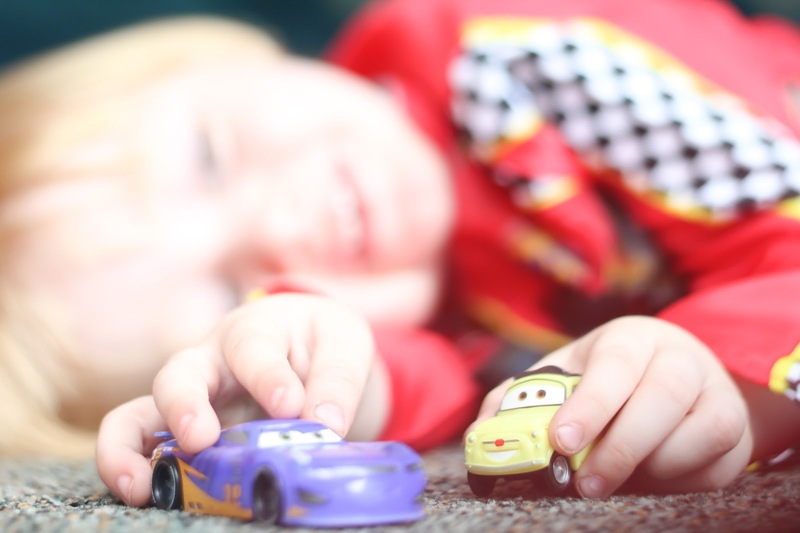 The set is excellent value as it contains plenty of cars for siblings to share and much to my delight there haven't been arguments about who gets to play with which car yet - there are so many of them to choose from that there isn't any need to squabble which is brilliant! And their other favourites? 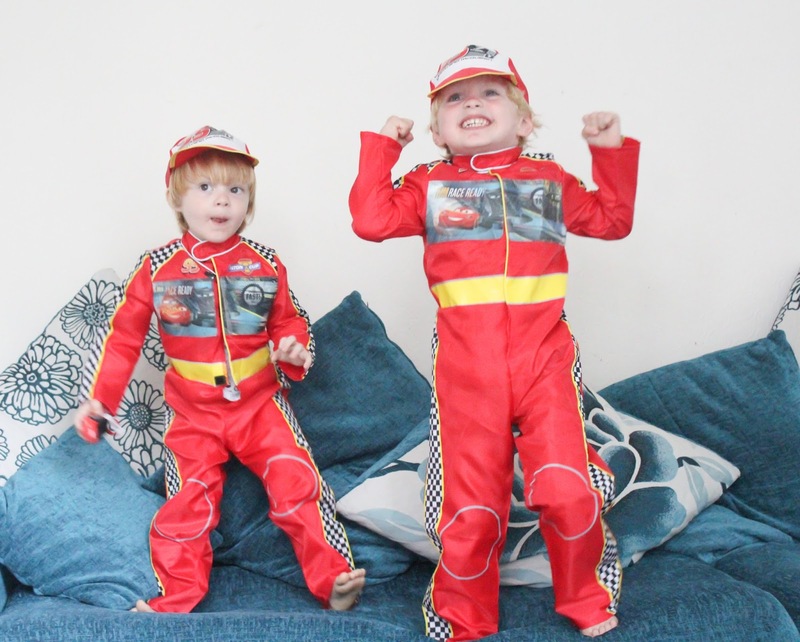 These adorable Lightning McQueen race car driver dress up costumes! 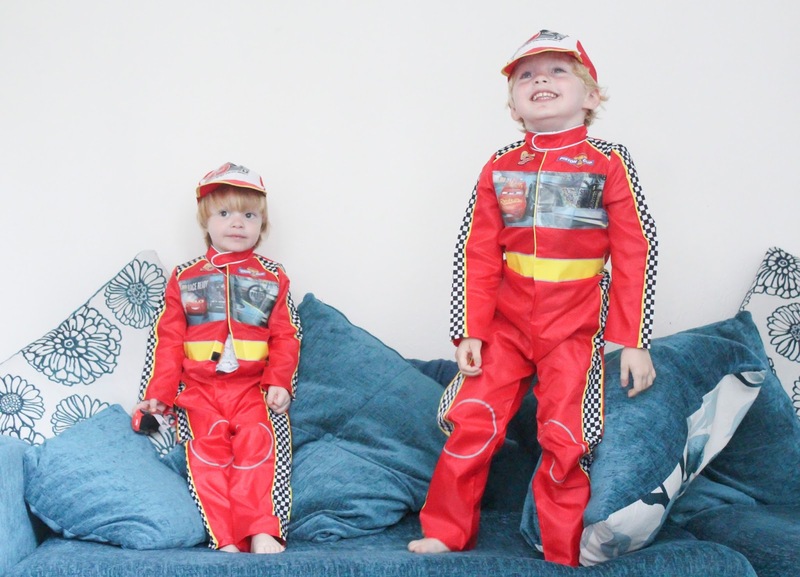 The costumes are really good quality, and the sizing is very good to - Noah was sent a size 3-4 to wear and Tyne a size 5-6, both fit perfectly. Don't forget Cars 3 hits cinemas on July 14th.